Newcastle upon Tyne, and the area surrounding it, is famous for its bridges across the River Tyne, particularly the railway bridges connecting it to Gateshead. 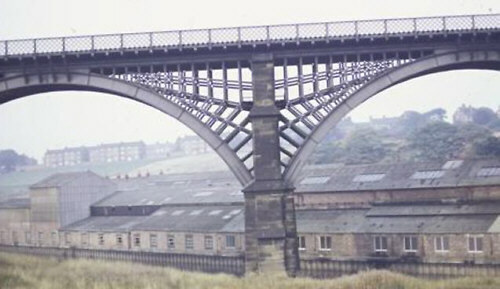 However, there are other examples of railway bridges and viaducts in the area that deserve mention, and this article will focus on some of the more notable structures that carry the North Eastern Railway (NER) around the area without going into too much detail on what is a very complex railway history. To do this, Gateshead on the opposite bank of the Tyne, and the other numerous urban areas along both banks of the river must be taken into account. The bridges will be dealt with in chronological order rather than scale in order to provide a better idea of how the railways connected this important hub to the rest of the country. For strategic reasons the Romans established their major settlement in the area around the line of a bridge at a point where the Tyne becomes hemmed in by steep hillsides on both banks, and it is these features that have dictated the need for major engineering works to allow the railways access to the two towns. There had been railways in the area previous to the opening of the first public railways in the 1830s, namely the large network of waggonways which spanned a period of some three centuries. These first public lines were the Newcastle & Carlisle, the Newcastle & North Shields, and the Brandling Junction (Gateshead to South Shields and Sunderland). 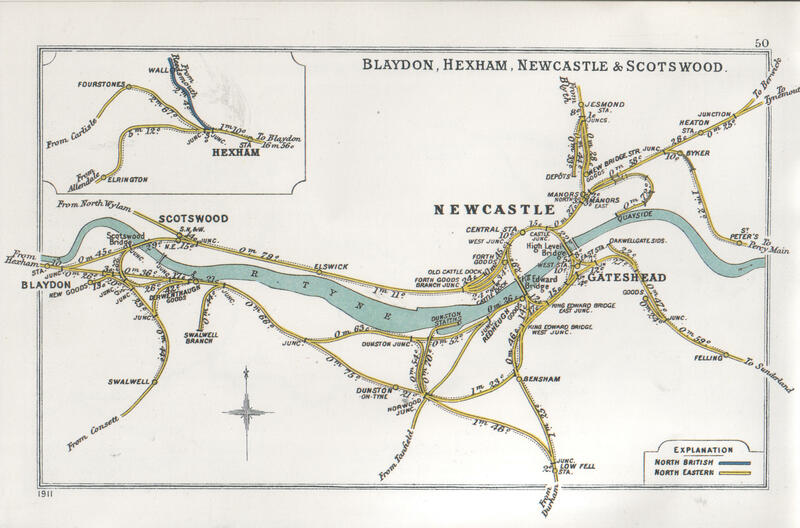 The latter two served the area to the east of Newcastle - the Newcastle & North Shields on the north bank, and the Brandling Junction on the south - were of only local importance, whereas the Newcastle & Carlisle Railway was an important cross-country link. The importance of the area increased when in 1844 George Hudson linked Gateshead with Darlington, York and London with the Newcastle & Darlington Junction Railway, and in 1845 the Newcastle & Berwick Railway obtained its Act of Parliament. In 1846 the Newcastle & Darlington Junction changed its name to the York & Newcastle, finally merging with its northern partner in August 1847 to become the York, Newcastle & Berwick Railway. The final step came in 1853 when the York, Newcastle & Berwick Railway ended its rivalry with the Leeds Northern Railway and formed a working relationship, culminating in their amalgamation to form the North Eastern Railway in 1854. 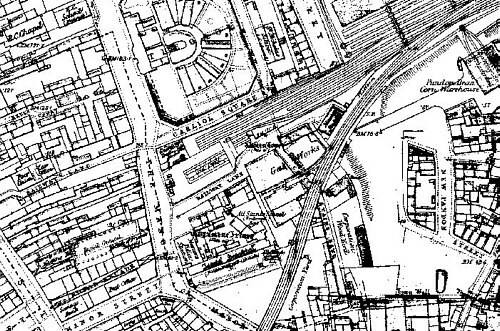 When an Act was passed on 21 June 1836 for a railway from Newcastle to North Shields, it was for a railway 7 miles long and commencing on the east side of Pilgrim Street. The engineer of the Newcastle & North Shields railway was Robert Nicholson (1808 - 1858), but the most dramatic contributions to the line were made by John and Benjamin Green, who designed the viaducts across the Ouseburn valley, between Newcastle and Byker, and Willington Dene, between Wallsend and Howden. 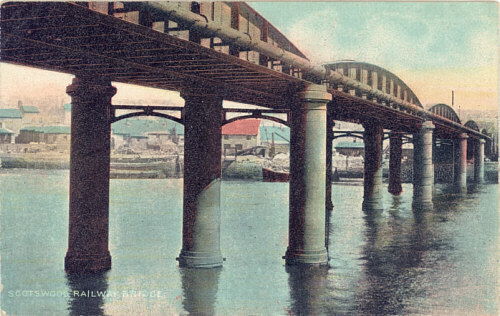 The viaducts were of laminated timber construction on the Wiebeking system and supported by tall stone pillars, and earned Benjamin the 'Telford Medal' from the Institution of Civil Engineers. The Willington Dene viaduct was built at an original cost of £25,000. Both bridges were rebuilt in iron between 1867 and 1869 to the designs of Thomas Elliot Harrison with great care being taken to replicate their original form. 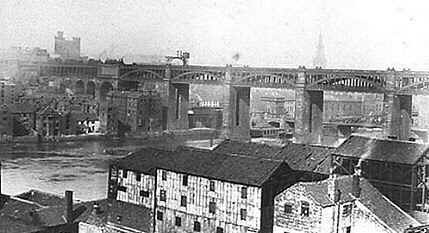 The Ouseburn viaduct was originally built with two tracks, in 1887 was expanded to four tracks with the the addition of a new viaduct alongside and to the north of the original) . In Germany Carl Friedrich von Wiebeking used laminated timber in the construction of road bridges. The individual laminates were substantial and secured together by bolts (with one notable exception at Altenmarkt which was glued). It was in France that the advantage of using curved members for other structures was recognised. Armand Rose Emy submitted a design for a roof using thin horizontally laminated timber arches in 1819, but did not use the method until 1825 in a trial at Marac, near Bayonne. The trial was a success and the "invention" made public by Emy in his own publications and by the French "Society for the Encouragement of National Industry" in March 1831. In Britain there is evidence that the technique was being considered independently at about this time. The technique was suggested for bridges over the Rivers Tweed and Tyne in 1827 - these were not built but the technique was picked up for use on other bridges. The technique was then applied to public buildings, but was relatively short lived. By 1850 wrought iron, which was both certain and economical, had replaced cast iron for most applications and was to replace timber as a structural engineering material for almost 100 years. The early laminated structures experienced difficulties with rot and glues and there were widely publicised difficulties with the very big laminated arches at Kings Cross, which could also have contributed to its fall from favour. 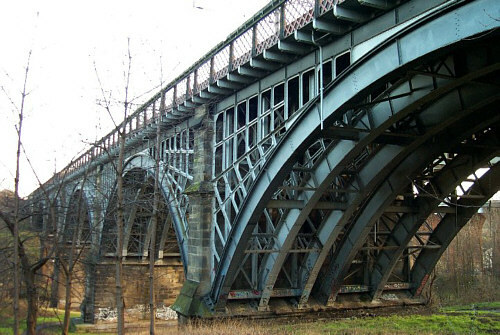 The viaducts at Willington and Ouseburn were originally built using this system on masonry piers but the timbers were finally replaced by similar looking wrought iron in about 1869 supplied by the Weardale Iron and Coal Company of Tow Law, Durham. After George Hudson's companies had completed an east coast line northwards from Darlington to Gateshead, difficulties in bridging the Tyne gorge forced passengers to make do with a fine station at Gateshead. However, the Newcastle & Darlington Junction Railway obtained an Act on 23 May 1844 which included powers to build a bridge across the Tyne. 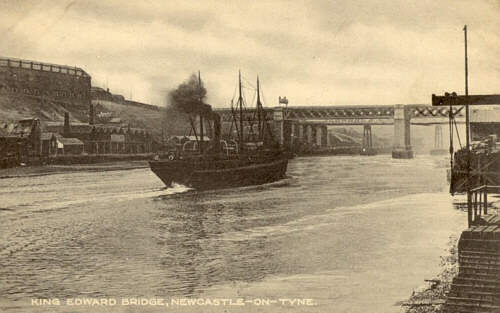 The financing was a joint undertaking between the Newcastle & Berwick Railway and the N&DJ with lines planned from a junction with the Brandling Railway from Gateshead, from the north end of the bridge to Neville Street in Newcastle, and from the north end of the bridge to join the Newcastle and North Shields Railway at Manors. 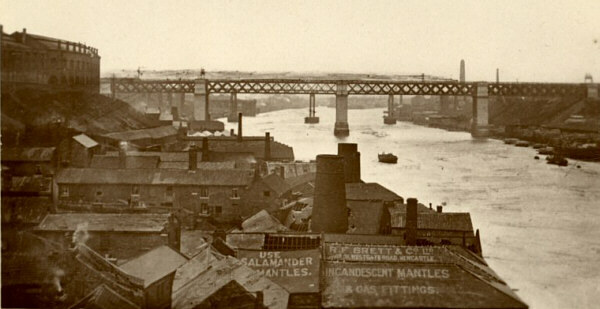 John and Benjamin Green had suggested a high level bridge from near the castle at Newcastle to Greene's Field at Gateshead, which would have been of a similar laminated timber construction as they had used for the Ouseburn and Willington Dene viaducts, but after suggestions that a more permanent material be used Robert Stephenson and T. E. Harrison (later engineer of the NER) produced a modified design crossing the river at the same point. This bridge consisted of six iron spans resting on ashlar piers, with three railway tracks carried on top of the arches, and a roadway suspended below by wrought iron rods. The first pile was sunk on 1 October 1846 using a Nasmyth steam hammer, and on 12 January 1847 the first brick was laid. In o rder to get railway traffic moving, and to help with the construction, a temporary timber bridge with one track was built to the side. This structure used part of the foundations for the permanent bridge and was opened on 29 August 1848. The first track on the permanent bridge was brought into use on 15 August 1849, and on 28 September the Royal train conveying Queen Victoria stopped on the bridge. The new bridge was completed to its full width of 35ft 1in when the temporary bridge was removed, and the roadway on the lower deck was completed on 4 February 1850. The total cost of the bridge (includin masonry, coffer dams, ironwork, road, railway, temporary bridge, Newcastle viaduct and land purchase) came to 491,000 pounds. Both road and rail crossing were subject to tolls, with the roadway toll abolished in 1937, and the railway toll finishing in 1952. 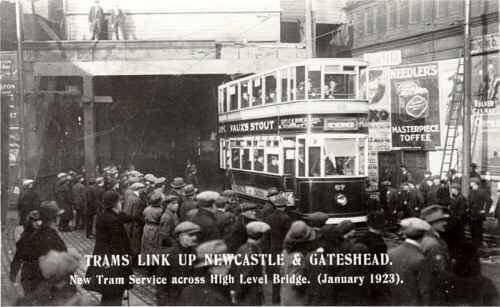 In 1913 the NER sought powers to run trolley vehicles across the High Level Bridge, but failed to get permission, but after long negations and strengthening of the road deck, trams were introduced between Newcastle and Gateshead on 12 January 1923. Interestingly the bridge is officially referred to as Leeds - Newcastle Bridge No. 323. The rail layout here was quite complex with the main line to Carlisle running north of the river as far as Scotswood and a branch line continuing on the north bank of the Tyne to North Wylam via Newburn where it rejoined the main line. On the south side of the river the original Newcastle to Carlisle route ran south of the river to a terminus at Redheugh, Gateshead, until the first Scotswood rail bridge was built of timber in 1839. Designed by John Blackmore it was damaged by fire caused by hot ash from a passing train in 1860 with a wooden replacement opening in 1861, which in turn was replaced by a temporary single track bridge in 1865 until the fourth bridge was built on this site in 1871 (costing £20,000) carrying the railway. The bridge is a six span wrought iron hogback bridge on five cast iron cylindrical piers, and was set at an angle to the river so that trains could approach the bridge at speed, there being no sharp curve onto the bridge. It required strengthening in 1943 and was taken out of use permanently in November 1982, along with Scotswood and Elswick stations. In the early years of the twentieth century a diversionary route from the King Edward Bridge via Bensham and Norwood was built linking with the 'old' line between Dunston and Derwenthaugh and this was used for freight trains. There was a complicated series of junctions south of the bridge giving access to and from this line and to the Derwent valley line via Swalwell to Blackhill and Consett. 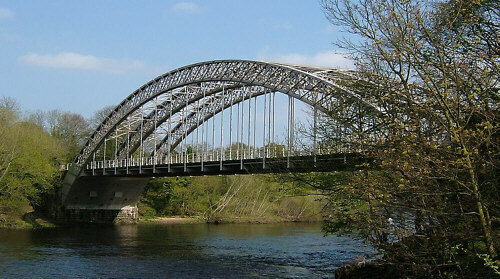 Situated about 0.8 km west of Wylam, this bridge was originally built for the Scotswood, Newburn and Wylam Railway to connect the North Wylam Loop to the Newcastle and Carlisle Railway. 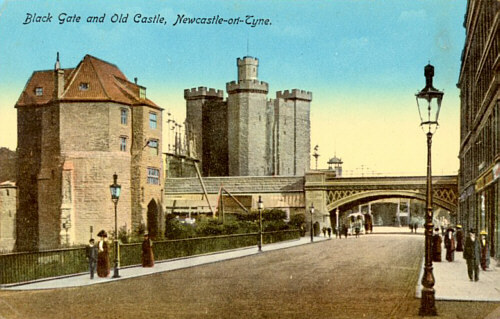 Costing £16,000 to construct, the bridge was engineered by W. G. Laws (later engineer for the City of Newcastle) with masonry and foundations by W. E. Jackson & Co., and ironwork by Hawks, Crayshay & Co. of Gateshead. It was originally proposed to cross the river with a girder bridge supported on three piers, but shallow mine workings and the possibility of nearby pits being flooded led to the design of a wrought iron free arch. The bridge was opened to rail traffic on 6 October 1876 and consists of a suspended deck 240ft long and 30ft wide for the railway tracks; the three ribs forming the arch springing from a level of 19ft 6in below the rails and giving a clear rise of 48ft. Freight trains were the main users of the bridge although some passenger trains on the branch were extended to Hexham. The railway closed on 11 March 1968 and the rails lifted in 1972. However the bridge is still in use as a footpath and cycleway. Although Newcastle was a through station this facility was not available to main line trains, which had to enter and leave from the east end. When part of the new main line using the Team Valley route was being built in the 1860s T. E. Harrison proposed building a new bridge 700 yards upstream from the High Level Bridge, but at this time the NER was engaged in a more extensive railway construction programme than at any other period in its history and the idea was not pursued. By the 1880s there were around 800 train and engine movements over the High Level Bridge each day and something had to be done, so in 1893 the NER decided to consider another river crossing and other traffic needs around Newcastle. 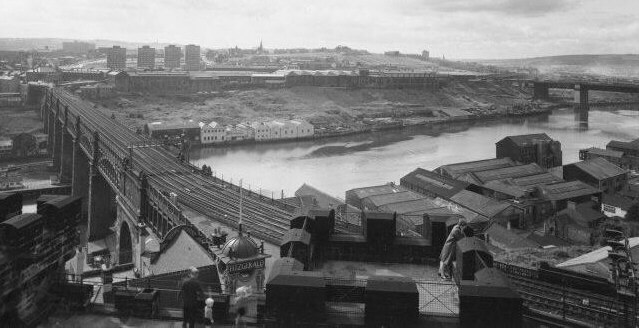 After five years the railway obtained Parliamentary Powers to build what has become known as the King Edward Bridge, but the drawback with T. E. Harrison's original proposal was that in order to avoid the embarrassment of knocking down part of the brand new Forth goods warehouse the northern approach to the bridge had to be positioned too far east and would have resulted in a very cramped layout at the west end of Newcastle station. However, a scheme by C. A. Harrison (the nephew of T. E. Harrison) sliced through the roof of the goods warehouse the width of four tracks. The cut ends were glazed and from trains passing over the bridge it was possible to look down to the floor of the warehouse. The erection of the bridge (masonry and steel work) was awarded to the Cleveland Bridge & Engineering Co. Ltd. On 13 February 1902 and eventually cost £500,000 excluding land and permanent way. The bridge consists of four spans of (from the south) 191ft, 300ft, 300ft, and 231ft, weighing 1,350 tons, 1741 tons, 1741 tons and 950 tons respectively, with masonry arches at both ends. The extra weight at the southern end is accounted for by the fact that the line splits over two viaducts to form a triangular junction with the Team Valley Line. The arches also crossed the 1839 Redheugh incline; the gradient of which was improved at the time the new bridge was built. 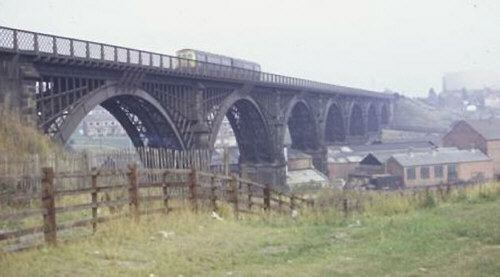 The building of the King Edward Bridge gave the NER the opportunity to provide the last link in a developing railway system to serve the industries around Dunston. The new line gave a direct connection from Gateshead to Dunston avoiding the Redheugh incline. The foundation stone for the bridge was laid on 29 July 1902 and although not completely finished was opened by King Edward VII on 10 July 1906. Regular traffic commenced running over the bridge on 1 October 1906 and the goods line to Dunston, which was built to the east of the main line and passed under it by means of a short tunnel, was opened in March 1907. After agreement to build Newcastle Central station on 4 February 1845 the Newcastle & Carlisle Railway got down to planning an extension of its line a distance of half a mile from the temporary terminus at Railway Street to the Forth. In 1846 an Act for this was obtained and the line was completed, mostly on a low sandstone viaduct of 44 arches, culminating in an ornamental cast-iron girder bridge across Forth Banks (no picture available) This seldom noticed viaduct, built with unusual forethought for 3 tracks, was rebuilt in connection with making the approaches to the King Edward Bridge. To the east of Newcastle station the North Shields railway entered Newcastle by an embankment across Pandon Dene, after which an impressive stone bridge, designed by the Greens, was constructed to carry the line over Trafalgar Street, Pilgrim Street and Dean Street, bypassing their Carliol Square Station (Figure 13) with the opening of the viaduct from Manors to Newcastle Central Station. 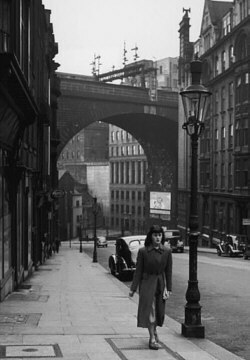 And lastly a wrought iron bridge over St. Nicholas Street. (Figures 12, 15 & 16). To enable express passenger trains and goods trains to bypass Newcastle station a plan was drawn up in 1918 for a new railway bridge across the Tyne. On 18 September 1919 the NER Estate Agent was authorised to negotiate with Newcastle Corporation for the necessary land to build a bridge situated near St. Anthonys to carry a line from north of Heaton to Washington. This commenced with north and south connections to the main line at Benton Bank, crossing the Heaton - Tynemouth line east of Walkergate station, and the bridge was to be constructed across the Tyne gorge at two and a half to two and three quarter miles from the beginning of the new line. The line would then continue parallel to the Pelaw - Washington route, but almost one quarter of a mile to the east of the 1848 line, finally connecting with it north of Washington station. Various connections were planned; north of the Tyne there were north and south connections from the new line to the Riverside branch between Walker and Carville. South of the Tyne there was to be a lengthy connection from the new line Wardley, northwards to join the Gateshead to South Shields line near Hebburn, and later a proposal for a connection from the south end of the new bridge to join the South Shields to Gateshead line near Felling. Finally there was to be a connection which ran from the Pontop and South Shields line at Beamish to join the East Coast main line between Birtley and Chester-le-Street. In April 1922 a price of 35,000 pounds was agreed for the land purchased from Newcastle Corporation and a further stretch of land was purchased from Lord Northbourne for £36,550 in December 1926. However, under the LNER the plan was allowed to quietly fade away. Rail Centres: No. 8, Newcastle, by K. Hoole; Publ. Booklaw Publications. A Portrait of the North Eastern Railway, by D. & C. Williamson and M.Grocock; Publ. NERA. 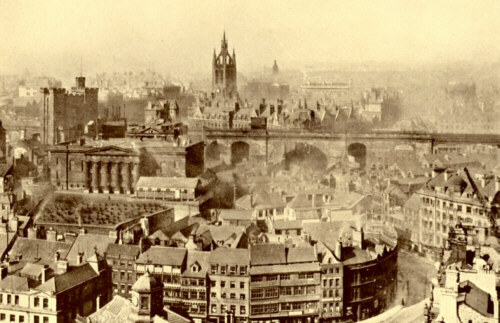 The High Level Bridge and Newcastle Central Station, by J. Addyman and B. Fawcett; Publ. NERA. Railway Archive, Issue No. 19.; Publ. Lightmoor Press. The North Eastern Railway. Its Rise and Development, by W. W. Tomlinson; Publ. Longmans, Green and Company. Thank you to Malcolm Peirson for the bulk of the above text and all of the images not credited to other people or organisations. Figure 1 is out of copyright but was sourced from Gateshead Library. The copyright for Figures 2 & 3 are owned by the SINE (Structural Images of the North East - a project of the University of Newcastle. Thank you to George Moffat for providing the information and text about the Wiebeking System, as well as the image of the Weardale Iron and Coal Co. Limited flyer.